UPDATE: The Speedy Devil has been recovered. Big high 5's to Roger/Kitsune Cycles. Keep an eye out for the XOXO still. One of a kind, & should be easy to spot. From Ben @ Handsome: STOLEN HANDSOMES!!!!! Last night the Handsome office was broken into. 2 bikes were stolen. A new 2012 XOXO and my personal SPEEDY Devil. The XOXO is easy to spot as NO ONE else in the world has one. It has a NuVinci rear hub, a ton of Velo Orange parts and a one of a kind custom made Handsome quill stem with an H engraved into the faceplate. The Speedy is my (Ben) personal bike. It is the first proto-type we made, and I am absolutely crushed that it is gone. Has a Thomson seatpost and stem, Paul Components brakes, levers and cranks, Civia bar, and Fyxation grips and seat. 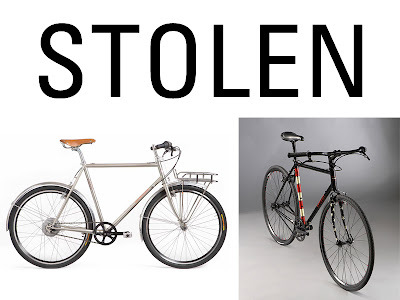 WE WANT THESE BACK AND ARE PLACING A BOUNTY ON THE HEADS OF THE FUCKERS WHO TOOK THEM. YOU GET US OUR BIKES BACK AND WE WILL GIVE YOU A CUSTOM HANDSOME COMPLETE OF YOUR CHOICE.